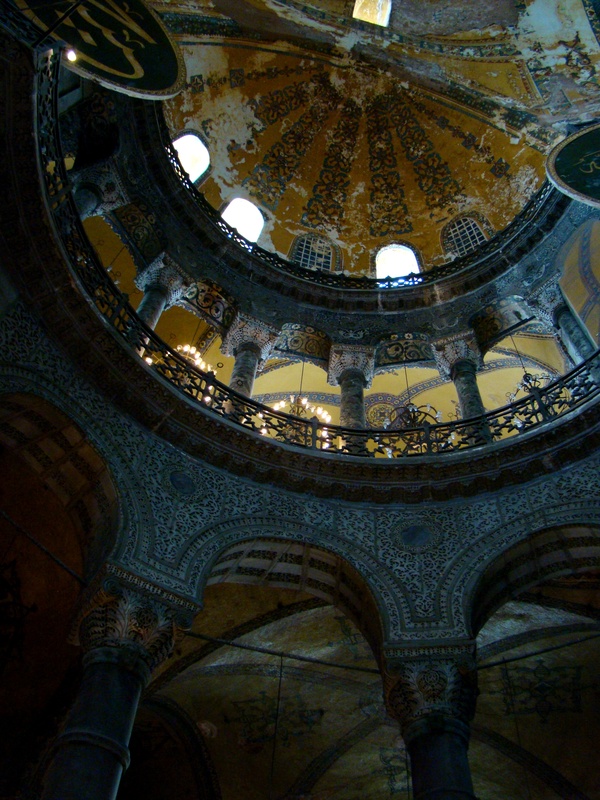 Interior view of the Hagia Sophia, showing Islamic elements on the top of the main dome. If you ever get to visit Istanbul you have to make a point of exploring Hagia Sofia, the church-turned-mosque. Not only is it unique in this aspect it is also one of the greatest surviving examples of Byzantine architecture in Turkey. It is one of those places you will have to visit more than once as it is so overwhelming that you cant take everything in during your first visit. Entering Hagia Sophia for the first time! Although scaffolding cluttered a part of the interior the thrill of experiencing the extraordinary spaciousness of this famous church-turned-mosque-turned museum is hard to overstate. As I walked in I was greeted by the marble pillars and huge decorated domes. The central dome (which was unfortunately filled with scaffolding) has a diameter of 31 m, which is just slightly smaller than that of the Pantheon in Rome. The dome looks like it is floating upon four great arches which are decorated with seraphim or six-winged angels and other decorative mosaics. 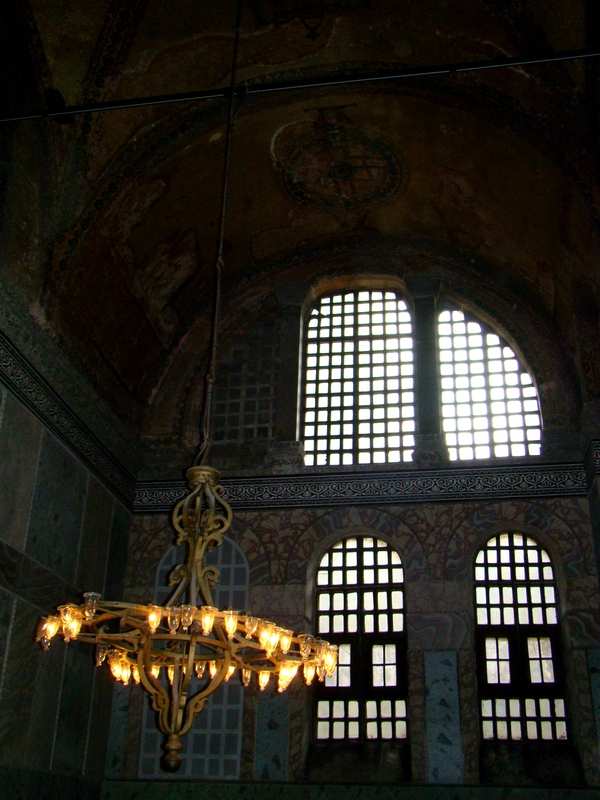 I read that Hagia Sophia is famous for the light that reflects everywhere in the interior of the nave, as its is very bright inside without the need for electric lights. This effect was achieved by inserting forty windows around the base of the original structure. Most of the interior surfaces are covered with marble, even the floor that you walk on. 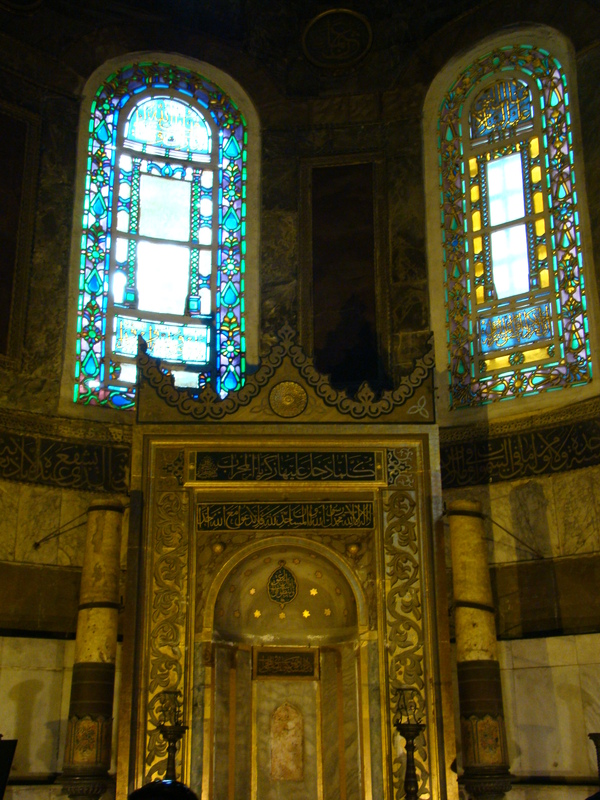 It is a lovely contrast against the walls which are green and yellow with gold mosaics. 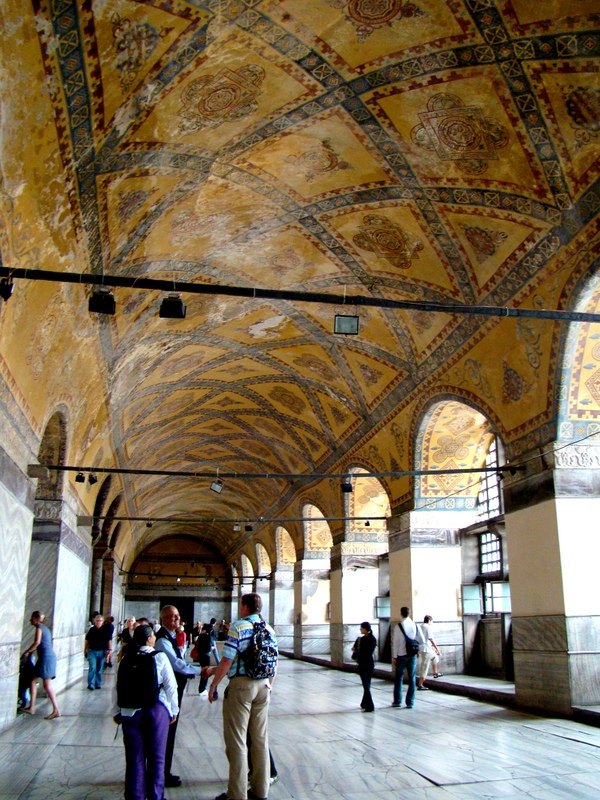 Huge parts of Hagia Sophia is decorated in a purely decorative geometric pattern mosaics. 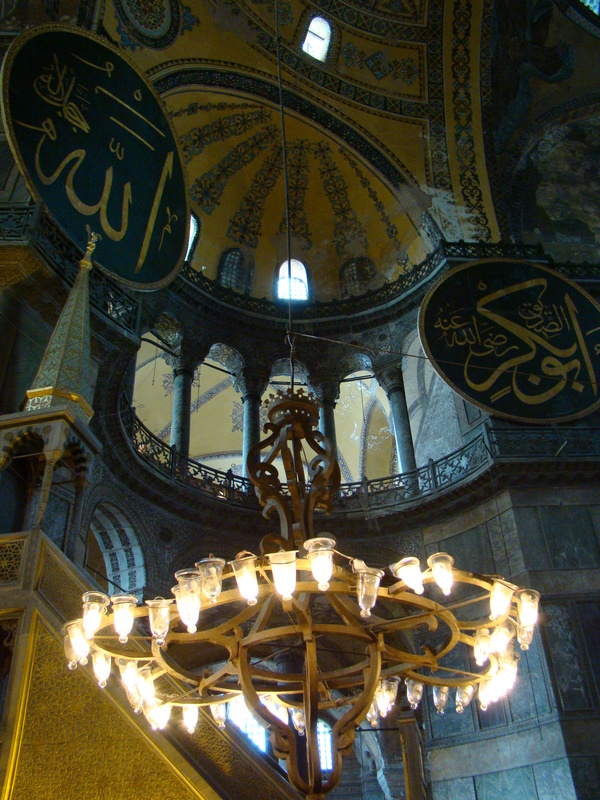 The huge Islamic calligraphic roundels suspended from the main dome also make for a fascinating religious contrast with the uncovered Christian mosaics on the upper part of Hagia Sophia. These gigantic circular-framed disks or medallions are inscribed with the names of Allah, the Prophet Muhammad, and the two grandchildren of Mohammed: Hassan and Hussain. A long ramp from the northern part leads up to the upper gallery. 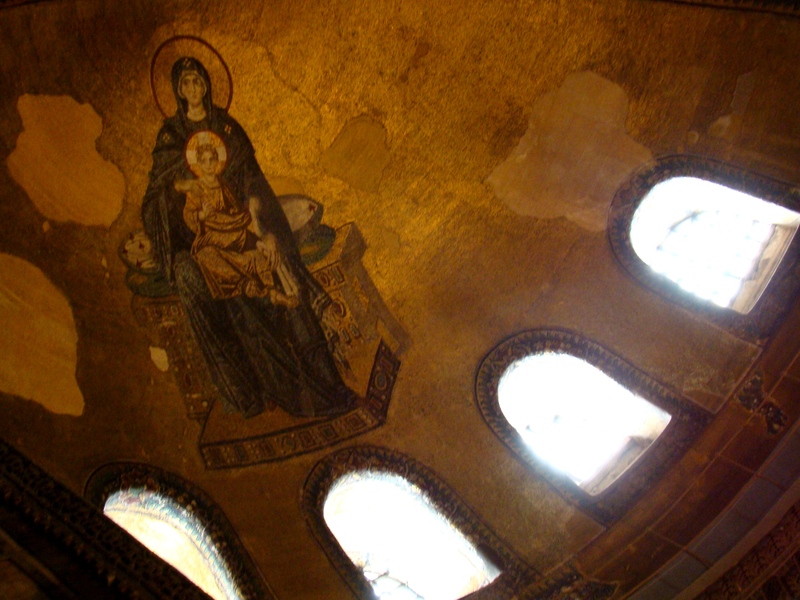 Looking up from this area there is a splendid apse mosaic depicting the Virgin and Child. I just love these beautiful pendant chandeliers that fill the huge interior. Although they are hardly needed for light during the day as light seeps through the countless windows. The gallery of this magnificent place provides a commanding view of the nave from all sides. It definitely gives the best vantage point from which to view and experience the vastness of this church-mosque. The Byzantine mosaics are being gradually uncovered, but only those on the higher gallery levels, which can be accessed by stairways. This means that Muslims do not have to confront much Christian imagery in the main chamber of the building, which was a mosque for nearly 500 years and retains all the equipment of a mosque. Unfortunately this part of the gallery was closed due to restoration that day. Because of its long history as both a church and a mosque, a particular challenge arises in the restoration process. Christian iconographic mosaics can be uncovered, but often at the expense of important and historic Islamic art. 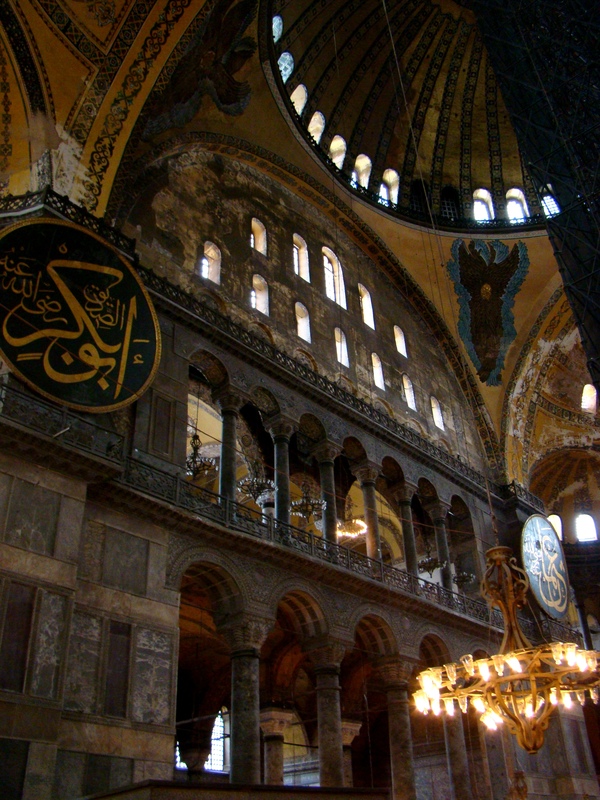 Restorers have attempted to maintain a balance between both Christian and Islamic cultures. In particular, much controversy rests upon whether the Islamic calligraphy on the dome of the cathedral should be removed, in order to permit the underlying mosaic of Christ as Master of the World, to be exhibited (assuming the mosaic still exists). Thanks Tiare! I am busy sorting through my photos and typing up all my Turkish adventures! Wow, look at that great architecture! Wonderful photos of what undoubtedly is a great place to visit! Thanks Christy!! While I was there it felt like I was constantly taking photos and now it feels like I didn’t even capture half of the beauty of this place. Amazing history. It is unfortunate that the restoration process will be a political and religious issue. I can see why one would want to spend more than a brief visit. I would love to go back again as I am sure that I missed half of it as it is so overwhelming. Wonderful photos in a challenging lighting environment. I loved my visit to Hagia Sophia and marveled at all the innovations that were embedded int the building like the little squares of glass that predicted earthquakes. It was so interesting to see how the different religions used this beautiful building. I definitely missed the little squares of glass that predict earthquakes. But I am sure I missed a lot as there is so much to take in that you cant do it all in one visit. one of the most amazing buildings on Earth! Thanks for sharing! I completely agree! It should be on everyone’s to-see list! Your photos and words really brings this beautiful building to life for us who haven’t seen it ourselves Janaline! I’ve always found it such a beautiful, exotic name; “Hagia Sophia”. Do you have any idea what it means? 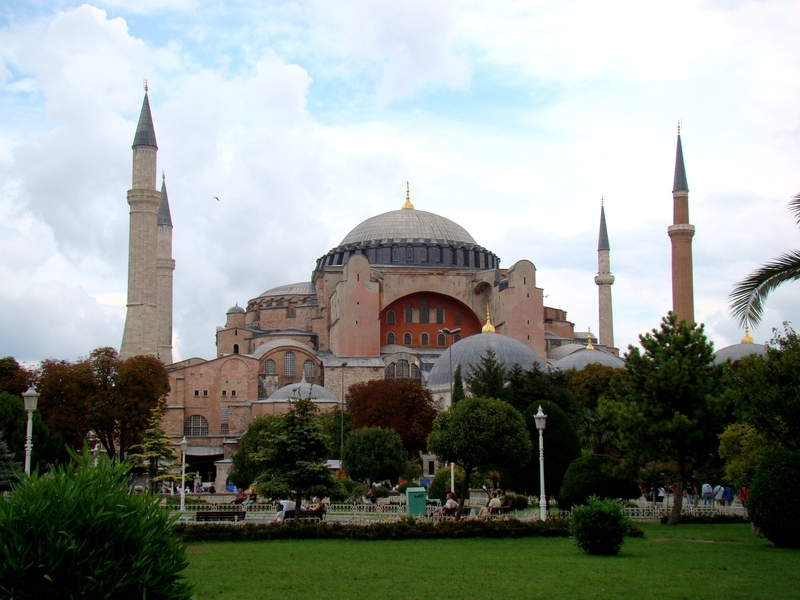 Hagia Sophia is from the Greek: Ἁγία Σοφία, meaning “Holy Wisdom. I think it is such a beautiful name for this building. It is a fantastic site, isn’t it! Did you find the Viking graffiti? I only found it during my second visit! Oh no, I didn’t know there was any viking graffiti. I will have to go back and look for it! I do hope you get to explore Turkey soon as it is such a beautiful country! I agree, you don’t want to lose either of them but to restore the one you lose the other which is quite sad. I guess all of us have heard of Hagia Sophia if we took geography or world history. But now I finally get to see the inside. Beautiful! It was such an amazing experience, being inside this building that I have heard so much about. And it was even better than I had imagined it would be. Wow… what an incredible work of art! Very informative post, Janaline and the images are really beautiful. Thanks Sreejith! Istanbul is an amazing place filled with so many beautiful buildings! Oh, marvellous – this is a place I intend to see….. I hope you get to see it very soon Sue, it is marvelous! Thank you! I do hope he gets to visit it someday as it is such a treasure to explore. Not only is it beautiful but it is also so rich in history and controversy.